My Aunt Juanita celebrated her 80th birthday in Eau Claire, Wisconsin over Memorial Day weekend. 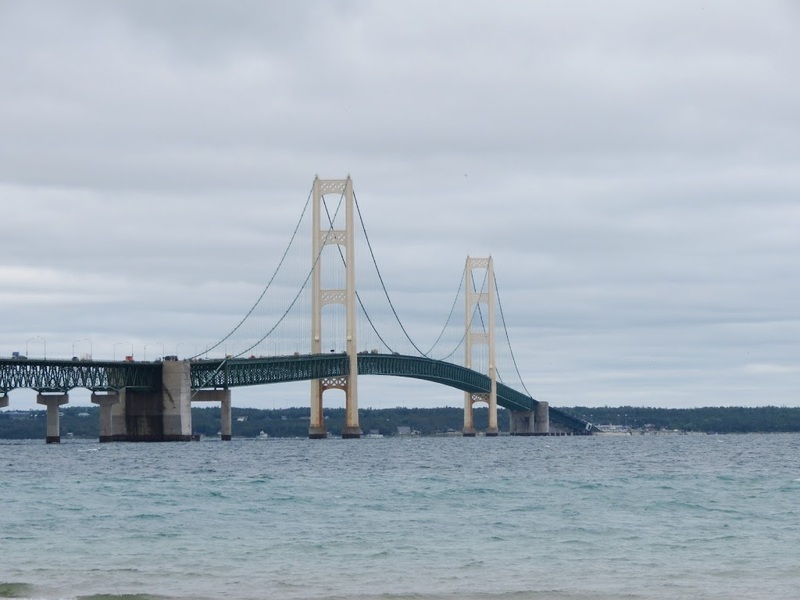 Georgia and I decided to extend our trip by coming home to Chicago the long way – through the Upper Peninsula then down through lower Michigan and Indiana. We left on Friday, May 25th, and spent the first night in Wisconsin Dells. On Saturday we went on to Bruce, Wisconsin to visit my mother. 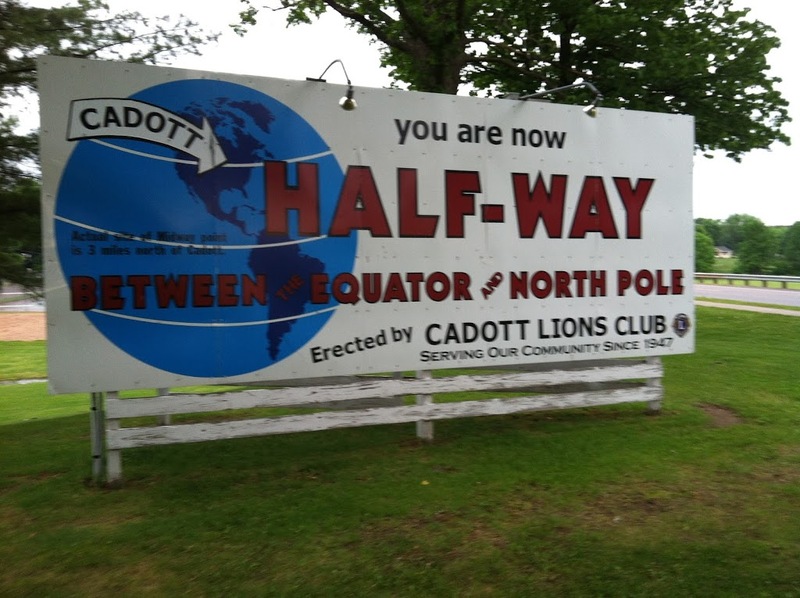 Along the way, we stopped in Cadott to have lunch on the 45th parallel where a sign announced that we were half way between the equator and the north pole. We spent that second night in Ladysmith. Sunday was the birthday party in Eau Claire where I got to spend some time with family members I hadn’t seen in years. We spent that night at the hotel where the party was held so that we could visit later into the evening. 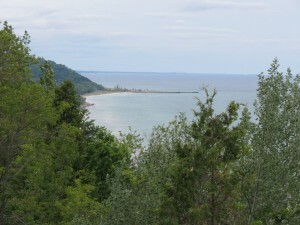 Monday was Memorial day and we spent the whole day driving from Eau Claire to Munising, Michigan. Along the way we were in and out of some very heavy rain storms so we were not able to do much sight-seeing along the way. It was bad enough in Escanaba, Michigan that we had to pull off the road for a while. This video shows the roads after the rain started to let up. 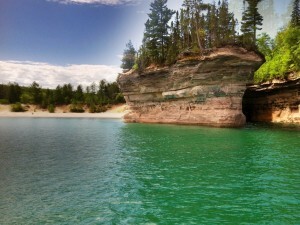 Tuesday started out chilly but dry so we took a Lake Superior Cruise to Pictured Rocks National Lakeshore. The water was very smooth making it a pleasant two and a half hours on the water. We got some great pictures of the rocks that have been carved by the wind and water. The rain started up again right at the end of the cruise so we got back in the car for the next leg of the trip to Paradise, Michigan. The UP has been hit hard by wildfires this spring and we were headed right into the biggest one – the Duck Lake fire – which had already burned over 20,000 acres. The heavy rain helped us on this day was we were able to go around the fire on roads that had been closed by heavy smoke before the rain. We had hoped to stop at Tahquamenon Falls but the park had been closed for several days because of the fire and was still closed when we went by. The park closing as well as the closing of several campgrounds in the Paradise area meant that almost no tourists in the area. That really hurt the area businesses since Memorial Day weekend is a big one for them. We were one of only three couples staying at our hotel that night. Every restaurant in town was closed by 5 pm so we had to drive 20 miles to get dinner. 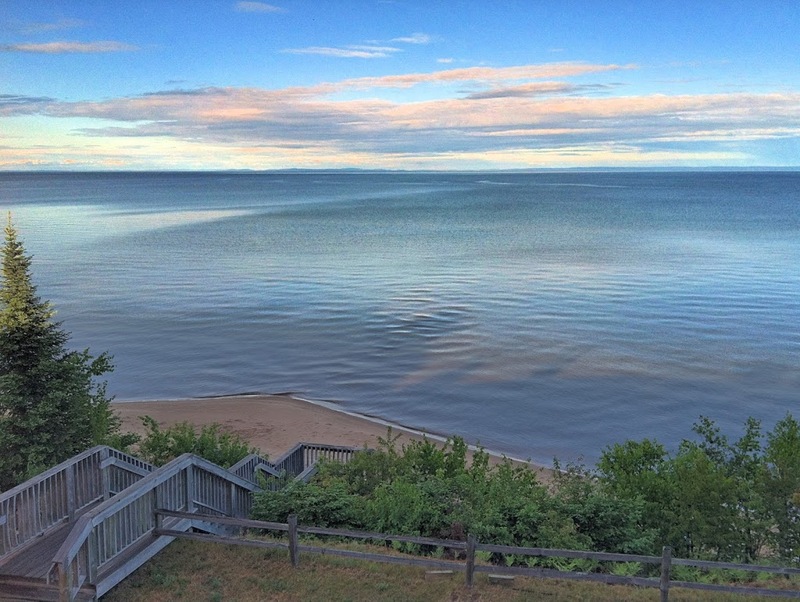 We did get a very nice room overlooking Lake Superior that night and the desk clerk called us later in the evening to let us knowTahquamenon would be opening the next morning. We visited the falls on Wednesday morning just as the park reopened. With very few other people there, we were able to take our time and enjoy the views and sounds of the falls. Then it was time to head south since our next stop was going to be Traverse City in lower Michigan. Today we only had overcast and light rain, no downpours like the last couple days. 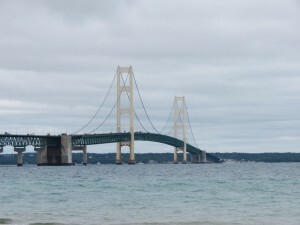 We reached the Mackinac Bridge about mid-day and stopped in Mackinaw City for lunch, shopping and some pictures of the bridge. 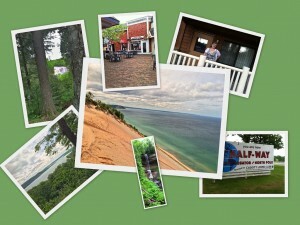 Then we continued on to Traverse City and checked into our hotel for the night. This was our wedding anniversary so Georgia and I went out for a nice dinner before turning in for the night. Thursday we drove to Maple City where we met up with one of Georgia’s distant cousins at the Nash-Pettengill Cemetery there. Everyone buried in the cemetery is a part of Georgia’s genealogy so we always make a stop when in the area. From Maple City, we made the short drive to Sleeping Bear Dunes National Lakeshore where we started out with the Pierce Stocking Scenic Drive. This 7.4 mile drive is a great introduction to the ecology of the Lake Michigan dunes area. Pull off areas along the route highlight special viewing areas. 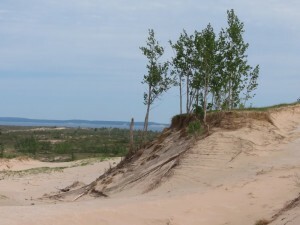 After the drive we stopped at the climbing dune where we had lunch and then on to Glen Haven. 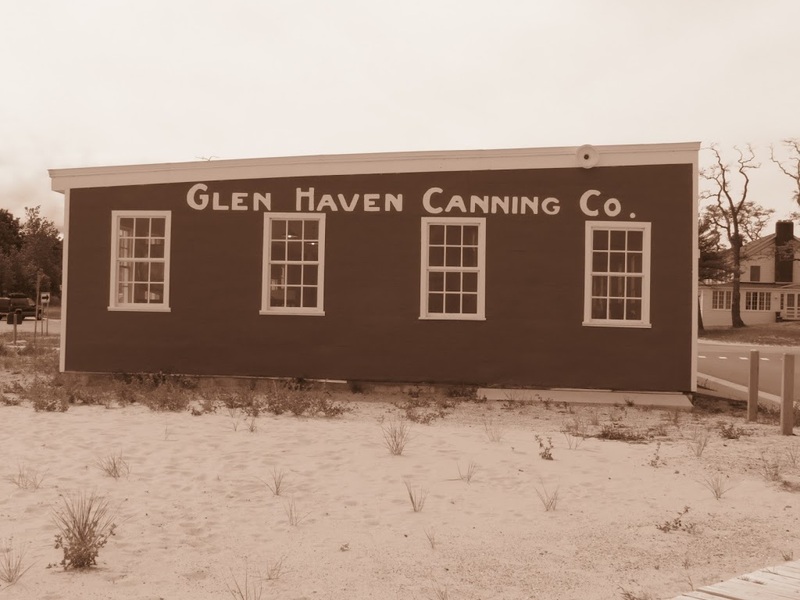 Once a tourist town, Glen Haven is now a museum village owned by the National Park Service. 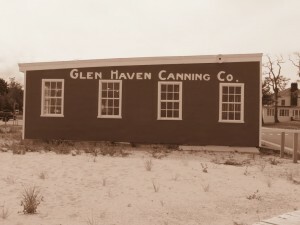 A blacksmith shop, inn, cannery and general store are among the building now being used as educational sites. 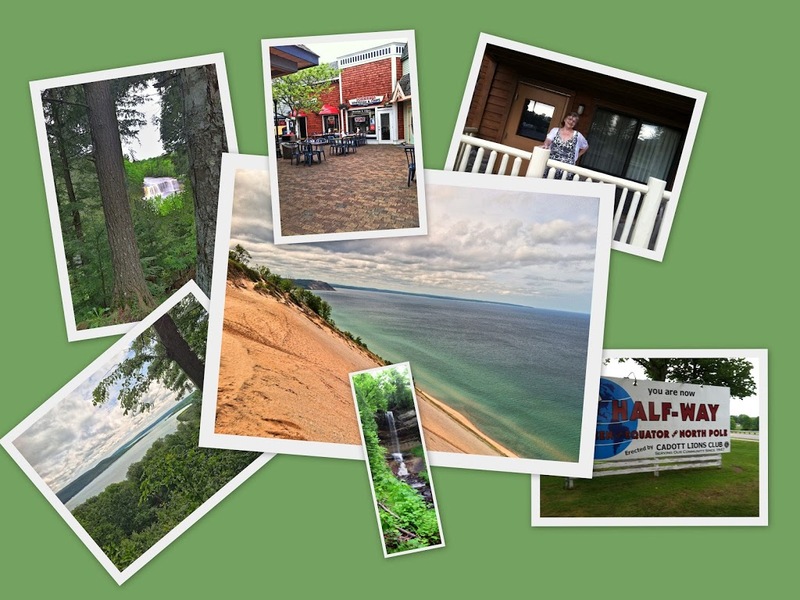 From Sleeping Bear, we leisurely continued along the Lake Michigan shore to Ludington with stops at some of the scenic views and small towns along the way. 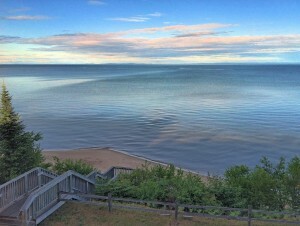 After dinner, we checked into our hotel for our last night along the shore of the Great Lakes. It was raining again on Friday as we drove from Ludington to Grand Rapids. We would spend Friday and Saturday visiting family and friends there before coming back home on Sunday. Recently looked at your posts on your travels. Very informative and brings back good memories of places visited with the family. Originally grew up in Michigan and the Mid-West is special. Retired now and began the writing posts on aviation physiology, safety and visual illusions in VFR and IFR flying started in 2009. I have your site on my Blog as one to follow. A favorite of mine! Thanks Jim, I’m glad I could bring back some good memories! I like you blo0g and I have added it to may blog roll. Thanks you for letting me know about it. Read through the Michigan experience. A ton of memories that flood back about scenes and places that fade away after time. Thank, thank you!